Close to the Finish Line! Photo by Leigh Williams, 2014. This semester has gone by incredibly fast, but, as they say, time flies when you’re having fun. The Century America project was so much fun for me to be a part of, and I had the best group members that I could have asked for. Together Julia, Jack, Candice, and I created a digital history website that successfully fulfills our contract. We stated that our mission was to “research and exhibit the narrative of the World War I homefront experience at the State Normal School and in the Fredericksburg area” and create an exhibition-like website to showcase this research. 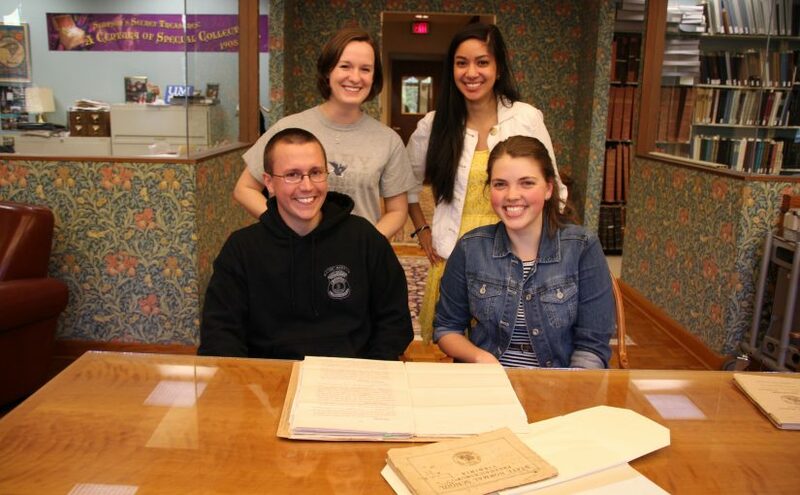 We spent many hours going through archival materials to learn about the homefront experience, and our 8 different pages on the site provide many diverse, intriguing narratives that showcase Fredericksburg’s and UMW’s history: Community and War Timeline, Knox Family, Urbane Bass, Josiah P. Rowe, Faculty and Staff, Academics, Student Life, and Influenza Epidemic. The homepage for the UMW Century America site is not as visually complex as we had originally imagined (images, quotes, other media, map, interactive elements), but I believe that the landing page we currently have is an effective but simple introduction that captures the visitor’s attention without overwhelming him/her. As originally planned, we split the site’s narrative into 2 main sections: Fredericksburg (town/community) and Fredericksburg State Normal School. Though the site is split in such a way, many of the narratives demonstrate the intimate connection between the town and school experience. The homepage for each subcategory has the image links to navigate to the 4 subsections, and we also decided to add some introductory text with basic information about Fredericksburg and FSNS, as well as a brief summary/preview of what visitors can find within the sections. For the Fredericksburg section we decided to do away with the Influenza page, due to a lack of resources, and instead create a “Community and War Timeline” page based on the extensive Virginia War History Commission materials and the William F. Liebenow diaries (mistakenly referred to in our contract as the Mary Eastburn diaries—there was some miscommunication with different CRHC staff as to the creator and name). This combination of materials and the lack of an Influenza page left us with one slot to fill, which we decided would be for Dr. Urbane Bass. Jack found much material at the CRHC and is fascinated with Dr. Bass’s story of service and sacrifice, so it was only natural to add it to the Fredericksburg section. It also gives a unique look into a small part of the African American experience in Fredericksburg during WWI. No changes were made to the categories for the FSNS section of the website. Some elements that were not mentioned in our contract, but not foreseen by us until actually creating the site, are side navigation links, “Voices of the Great War” stories, and the placement of citations (the bottom of each page). We also have the “About” and “Resources” page, as listed in our contract, as well as a “Sponsors” page. The main menu is a consistent element on every page of our site. The Resources page includes our bibliography, and as stated in our contract, the page also lists the most important archival collections to our research with links to the collections’ home institutions/organizations. For the main Century America site, we successfully created a website that introduces all of the Century America projects and captures visitors’ attention with an interesting headline. After many struggles with MapsAlive, we (mainly Candice and Julia) were finally able to create an interactive map embedded in the homepage that links to the other schools. We were also able to create an engaging interactive timeline for the main site. We added “About” and “Credits” pages to the main site in order to give viewers more information and direct them to places that might answer their questions (individual projects, official school websites, digital portfolios, etc.). This site fulfills its mission of introducing and explaining the Century America project and that schools involved in it. We successfully met our milestones with only a few minor snags that were really out of our control—digitized materials from the CRHC were received a couple days past our deadline, and the Century America homepage/interactive map was not complete due to embedding issues and lack of response from our virtual classmates. Our division of labor was as listed in the contract, and we each made excellent contributions to the project. We also helped each other as much as possible. As far as advertising goes, we have been tweeting a lot about the project and a news story will be released very soon about our project. After final approvals and changes from Dr. McClurken and Dr. Pearson, we will blitz the internet with advertising for our awesome site. It was such a great experience to work on the Century America project and be part of a groundbreaking digital history experiment. Dr. McClurken and Dr. Pearson, thank you so much for this wonderful opportunity. This week Julia, Jack, Candice, and I have been working on the UMW and overarching CA websites, mostly just making tweaks to existing content. Unfortunately for us, but fortunately for Candice, Candice now has a real-life job at the Virginia Historical Society! It’s really awesome, but we never get to see her anymore. For the CA site, I finally got the timeline to order the categories correctly, thanks to the wonderful Ryan Brazell from DTLT! Ryan informed me that the categories structure themselves based on chronology–so the “International” events appeared before the “National” events because the first International event occurred in 1914, whereas our first National event occurred in 1916. For simplicity’s sake, we decided the easiest event to add would be Woodrow Wilson’s election to the presidency in 1912. We also added his re-election in 1916, especially because his primary platform was neutrality. I also decided to add a link on the home CA page to the timeline within the widget, so that there is something on the home page (besides a menu option) that prompts viewers to explore the timeline. We made the minor changes to our wording that Dr. Pearson suggested. The only other change is on the “About” page. I change the links for each school (within the main content–not the widget) to go to those institutions, rather than the CA websites. Additionally, I thought it would be nice to link to our digital portfolios. Aside from our group, only Dara has told me that she is working on a digital portfolio that we can link to. If anyone else has one, please let me know! The only huge thing we have left to do for the CA site is to add a bibliography with the full citations for images from the timeline. As far as the UMW site goes, we are currently experimenting with drop caps (inspired by the lovely Jenn!) and footnote placement. For the drop caps, sadly the plugin is not totally compatible with our pages because the first letter of our page content is often not the first letter of the paragraph. I added CSS myself for the drop caps and will have to put them individually on each page, but it really doesn’t take that long. For the footnotes, we ultimately decided that having them on the page will be much better than having them all lumped together on a separate page. We liked the idea of having drop-down citations, and once again, DTLT came to our rescue! Timmy sent Jack some code so that our citations can exist at the bottom of the page, but are essentially hidden until visitors choose to view them. We need to go over each of the pages with a fine-toothed grammar comb. Otherwise, the only huge thing we have to do for the UMW site is to add a comprehensive bibliography. Since most of what we have been doing is making tweaks to the two websites, our in-class update in Dr. McClurken’s Digital History seminar was an exciting game of jeopardy! If you all are curious, our jeopardy game can be found here. At Julia’s extremely clever suggestion, we rewarded the winning team with Smarties and the losing teams with Dum Dums. Essentially, we have made great progress, and the polished first versions of both of are sites are complete. We definitely still have some playing around to do with formatting and aesthetics, citations (still figuring out the footnote placement), etc. Our biggest news for this week is that thanks to the awesome Ryan Brazell, we have been able to embed our interactive map into a WP page! Other than that, we just have some kinks to work out and editing to do. I’m really happy with how everything has come out so far! Posted on April 9, 2014 Author adminCategories Weekly PostTags websiteLeave a comment on Finishing up the Site! I previously made a post about today’s readings for the COPLAC portion of this class, which can be found here. However, I did also skim Sherman Dorn’s article, as Dr. McClurken suggested, and I am quite fascinated with what he has to say, and I think Dorn makes some intriguing points about digital history. I really like how he frames digital history as yet another historiographical development that contributes to the development of the field–an astute observation, and one that I had not considered. Digital history has definitely added a new dimension to the field, especially because the question still remains about reliability, source citations, etc. I also like how he points out the breadth and depth of various digital history projects, especially the extent to which they make an argument. This point rings particularly relevant to me because it is something that I have encountered in the COPLAC portion of this class. Some of my virtual classmates are going for creating an online archive, while others like Julia, Candice, Jack, and I are creating an exhibit. It’s interesting to see how each of us interpreted the Century America project and what we have done with it. And even then, the “exhibits” that we are creating are more along the lines of narrative history, rather than history that makes an explicit academic argument like you might find in a monograph. Like Carr, I am extremely unsettled by Google’s assertion that we might be greatly improved by artificial intelligence, or if our brains were completely replaced by artificial intelligence. The thought alone is scary. Intelligence is simply not that simple–you can’t replace it in one fell swoop. There are several different kinds of intelligence (8, according to Howard Gardner’s multiple intelligences theory) and I truly believe that no artificial intelligence could completely embody any one of them, let alone multiple ones or a combination of some. It could perhaps come close with the logical-mathematical intelligence, but otherwise, no. Our minds are complex and each one is unique–there is absolutely no way that supplementing or replacing our brains with artificial intelligence could improve the way we think (unless the goal here is to process information like a machine–personally, I would rather not do that). AI would have to be extremely versatile and malleable to be able to adapt to each different person’s mind because, as Carr points out, our minds themselves are malleable, forever changing. I have very strong feelings on this topic, but I will leave my ranting to a minimum and simply end by saying No. 1. I would like to note that I read all of the articles for class, but am choosing to blog about the ones about which I feel most strongly. 2. Random thoughts about the other readings: I like how sassy–for lack of a better word–Dan Cohen is in his piece about N-Grams. And as per Turkel’s piece, I can’t believe people actually want to know the history of all those topics–shaving legs? Really? This week our milestone was to have all of the text for our website drafted, and we successfully met it! Not all of the text has been uploaded and published on our site yet–that is the next step that we will be working on. We also need to add in citations for our work (an issue that we are still discussing: footnotes? endnotes? where do we put them? etc.). Colin mentioned in class that I showed him how to do footnotes in WP. For anyone else interested, here are the basic instructions. Place the numbers for your footnotes where they would normally appear in the text body. When you’re writing a post, there are two view options: Visual and Text. The default view is Visual. To make a footnote, switch to the Text view (top right-hand corner). Find the numbers that you need to superscript. Enclose the footnote numbers in the superscript tags, like so: “sup”1″/sup”. Except instead of quotes, use the triangular brackets < > . At the bottom of your post/page, create a line (I simply use A LOT of hyphens). This step can be done in the Visual or the Text view. This is a sentence containing information that needs to be cited.1 If you have any questions, just ask! Additionally, we’ve also been ironing out navigation issues with our site. I am an advocate of drop-down menus, so that visitors wouldn’t have to return to the Fredericksburg or FSNS homepages in order to choose another category. Basically, it’s easier navigation. However, Julia, Candice, and Jack didn’t like the idea of drop-down menus, especially because they can be distracting if accidentally moused over by a viewer. We have compromised by adding links at the bottom of each narrative, so that viewers may continue on to the next story (or go back), and we will also include navigation links in a custom sidebar so that visitors do not have to scroll all the way to the bottom for navigation. The sidebar is also great because it shortens the width of our text area, which was too large for our liking–we were afraid it would intimidate viewers. Another navigation issue we struggled with was where to place the icons for each narrative within the Fredericksburg and FSNS main pages. We want visitors to read the introduction text, so we initially placed the icons at the bottom. However, when they are at the bottom, you can’t see them until you scroll all the way down–visitors may never know that they’re down there if they don’t bother to read the whole page! We considered placing them alongside the text, Wikipedia-style, but decided that that method wouldn’t look as visually appealing. Our only concern with having the icons at the top of the page was that visitors would automatically click the icons without reading the introduction. However, as long as we keep the icons a reasonable size (which we are) visitors can still see the text below and know that there is something they should read before looking at the other narratives. A classmate of ours (from UMW’s ADH2014 class) suggested labelling the narratives chapters–an idea which we really like and are trying to incorporate into the site. We aren’t going to number the chapters because that may seem too constricting, so we are just keeping them as categorical chapters. Aside from the larger issues of navigation and layout, we have been battling the smaller issues in WP like image gallery spacing and visibility of image captions. We have also been having great debates about what pictures to use for the icons on the Fredericksburg and FSNS main pages, as well as the home page for the entire site. It’s taken a lot of backtracking and persistence, but we have finally located images from the time period that are representative of Fredericksburg and FSNS, as well as each of the categories we discuss. (There is one category–Influenza Epidemic at FSNS–that we could not find the perfect image for. We were hoping to find an image of the FSNS infirmary, which I thought definitely existed, but apparently my brain completely fabricated that memory. We settled for a picture of two students in nursing uniforms.) Finding these images has actually been really exciting because they help the site take a much better shape and definition! Finally, we have also been working on the overarching Century America home page. Candice talked to the MapsAlive people and Dr. McClurken has cleared it for our use!2 This interactive map will be on the CA homepage and have links to the websites for each of our schools. The homepage will also contain brief information about the project and class. On a separate page there will be a large timeline (thanks everyone for sending me your dates and citations!) with school, national, and international events from the time period. The CA will also have a separate “About” page and “Credits” page. It has been an exciting week for us at UMW–we love the shape our site is finally taking!! 1. Wow, a footnote! How cool! 2. Special thanks to Dr. McClurken for finally approving our choice of MapsAlive. This week’s progress report for the UMW group can be found here! I just have a few comments of my own to add. As Jack mentions in the progress report, we went back to the CRHC this week to make digitization requests. The woman who normally scans was not in that day, but the next day she scanned and emailed me all of the items that I requested. I also received scans from UMW Special Collections (only a few because luckily the main sources from Special Collections are already digitized and online), so everything for my portion of the UMW site has been digitized! I don’t know if we will include every single digitized image on the history pages, so hopefully we can put additional images into the image galleries that Jack is creating. Our next milestone is March 20, by which date we have agreed that we will all have the text for the website complete. I have started writing the “Student Life” page for the Fredericksburg State Normal School portion of the website, and after completing that I will write the “Academics” page. Both of these pages are really fun to research, and it is fascinating to see the sort of changes that the Great War wrought upon course offerings at the school (some of which you can read about in this blog post). In going back through some of my sources and doing additional readings, I found some really cool bits of information! The coolest find for me was that several professors and student clubs adopted French and Belgian war orphans! It seems that the professors or student groups only cared for each orphan for a year, so the “adoption” was not permanent–nevertheless, I think it is still amazing that the teachers and students were so involved in caring for victims of the war. In all, the Fredericksburg State Normal School adopted 5 war orphans during the war years! I also found some excellent quotes while I was reading through yearbooks and academic catalogues and bulletins. I will include them below. Note: The featured image for this post is from the 1918 Fredericksburg State Normal School viewbook. My digital portfolio is finished for the most part! Aesthetically, I still have a couple elements that I would like to alter. You can view my digital portfolio here. I chose the Matheson theme because it is sleek and simple–a great place for me to showcase my academic and professional work. The homepage of my digital portfolio is a short “About Me” section. I originally wanted to have separate About and Home pages, but I realized there wasn’t much I could say on the Home page that I wouldn’t also be saying on the About page. Next I have my complete CV online. I am working on making it available as a PDF in addition to the web page. I want to change some of the formatting, but this page was simple to create. I wanted to showcase my academic/research experience and my archives/museum experience, so I decided to create two separate pages for these. I would like to add a list of courses that I have taken at UMW onto the Academic page, because at the moment it only lists my major research projects. I think that providing a list of other courses I have taken, in which I have done smaller research projects and papers, will give a more comprehensive view of my experience and work. Next, my Archives/Museum page details my experiences in these areas. I would like to elaborate a but more on my experiences, because right now it looks essentially the same as my “Experience” section on my CV. I’d like to add more material to both, so that visitors can get a better idea of what I’ve been working on. EDIT: After much consideration, I decided to switch from Matheson to a different theme so that I wouldn’t have to worry about finding an appropriate header picture that I wanted to appear on every single page of my digital portfolio. My portfolio’s current theme is Preference Lite, which I really love because of the colored menu bar! I don’t have to worry about finding an image, and the menu bar adds a splash of color, but isn’t overwhelming. The three sites I looked at for this assignment are: Digital Tattoo, Dr. McClurken, and Caitlin Murphy. The following are lessons about digital identity that I have learned from these pages, hopefully in some semblance of order. 1. Until this class, I’d never considered a digital identity beyond the scope of social media like Facebook, Twitter, and Tumblr. So for most of my digital life, I have always thought of a digital identity as something intimately and exclusively connected to my social life–an “informal” life, if you will. After attending some Domain of One’s Own workshops and looking at Dr. McClurken’s and Caitlin Murphy’s pages, it dawned on me that you can also have a professional digital identity, something on the web for employers to discover besides your Facebook profile (or, God forbid, your MySpace page). I have always tried to be judicious and thoughtful about what I post on social media, in order to control that aspect of my digital identity, but it never even occurred to me that I could construct the professional side of my digital identity–something that I would want potential employers to find. 2. On the topic of being selective about what I (and others) contribute to my social digital identity, the amount of stupid and/or illegal things that people publish on their own digital profiles never ceases to amaze me. While browsing Digital Tattoo, I came across an article about a ridiculously stupid trend called “Neknomination.” Basically someone drinks an obscene amount of alcohol, posts a video of it on YouTube and other social media, and challenges someone else to do the same thing on an even more dangerous and ludicrous level. The viral nature of this trend is enhanced by people’s desire to get “likes” and to become virtually famous. I guess the lesson here (that I am fortunately already aware of, but this article truly underscores) is to not put immature, dangerous and/or illegal material online that could tarnish your digital identity. 3. Additionally, just as your real-world identity does not solely consist of you, neither does your digital identity. It also consists of the people, organizations, institutions, etc. with whom you engage online. The Neknomination fad is strongly connected to digital peers, according to Digital Tattoo: “Students may feel pressure from their friends and cohorts to participate, as those who do not accept the challenge or who do not outperform their nominator, risk losing face among their peers.” Even if you don’t rise to the challenge, per se, a tag, like, or comment on a Neknomination video/post goes onto your digital record. Just as you should be careful in choosing your real-life friends and associates, you should also carefully construct the friends and other entities that are connected to your digital identity. 4. Another interesting lesson I learned from Digital Tattoo was the extent of my, or anyone else’s, digital identity, or what they call a “digital dossier.” DT’s page and video about digital dossiers points out that your digital identity is created before you even get online, which I think is especially true today, and it lives on after your death. I see countless mothers, young and old, posting pictures of their children on Facebook and other social media, creating a digital identity for their children before the kids even know what a computer or the internet is. The purchases you make online, medical and other records filed on you (behind hopefully secure barriers), any websites you may use, all contribute to your digital identity. Even after death, online obituaries, condolences, and memorials further add to your digital identity. Until visiting this page on DT, I had never realized just how much makes up someone’s digital identity, and how it is partially out of your control (what happens before and after your internet life). 5. The above point being said, Dr. McClurken’s and Caitlin Murphy’s profiles highlight the amount of control that you do have in constructing and enhancing your digital identity, and just how much better the web may be for a resume/portfolio (depending on the person, of course). For example, Caitlin’s digital resume is perfect for her interests in photography and video: she can easily display her work for friends, employers, and anyone else who may stumble upon her site. Additionally, even though photography and video may seem like hobbies to some, Caitlin’s site allows her to present her interests in a professional manner. Dr. McClurken’s site conveniently keeps all of his professional experiences in one place–something that would probably be an absolute pain and an environmental threat to the trees if it had to be examined in physical paper form. Looking at these two sites, and also considering my ever-increasing involvement in the digital world (professional and social), I am quickly realizing the advantage of having a digital resume as part of my digital identity. I honestly hate including web addresses on my CV (they take up space and probably divert attention), so it seems like a digital resume will be the perfect solution for me! I will, of course, keep my regular CV as well. The first article I read about the impact of digital history on the field of history was by none other than our very own Dr. McClurken. The first thing that struck me from this article was how much digital history, and digitization in general, has changed classroom teaching. Without the perspective of more than 21 years, all I have ever known in conducting serious archival research is having many materials available online, searchable catalogues, and occasionally photocopies or reproductions. I kid you not, my mouth dropped to the floor when I read that he used transparencies to show students nineteenth-century handwriting. Transparencies!!! That just boggles my mind, and I think really highlights how much digital history has changed the classroom. I also didn’t realize how much a dependency on digital history and its materials can cripple a class, if user interfaces, urls, or accessibility change. I definitely have to agree with Dr. McClurken that the relationship between the college classroom, and I would even say academia in general, and archives is mostly Web 1.0. From what I have seen with the digitization projects I’ve worked on, right now it’s all about actually just getting everything digitized and putting it up online, making it accessible. Oftentimes, little to no thought is given to how the accessibility of these great collections will be promoted. However, I would say that some institutions are definitely taking the dive into the ocean of social media and handling it pretty well! I am most familiar with the Smithsonian Institution Archives, and I know that SIA has a pretty active Facebook page, which can be found here. SIA makes at least one post a day, that highlights an item or items in its collections, and they usually try to make it relevant to current events. SIA’s blog, The Bigger Picture, also updates at least once a day with relevant content–right now SIA is posting a lot of content about collections related to women in science, in honor of Women’s History Month. Beyond Facebook, though, SIA isn’t really present on other social media platforms, and I hope that this fact will soon change. As much as some people look down on social media, there is no denying that Facebook, Twitter, etc. reach an incredible number of people, and institutions could reach a much wider audience if they embraced social media more. (I do realize that the issue is not that simple–there are many other things to consider when getting involved in social media, like Who tweets? Do they have to be approved by someone? Do you follow back people? Are you endorsing the people who follow you? Etc.) Part of Dr. McClurken’s point, though, is that this relationship is between the classroom/academia and the archives, and as we all (hopefully) know, a healthy relationship is a two-way street. So it can’t just be the archives who are embracing the social media and putting themselves out there. The classroom and academia must also embrace these social media platforms, which I think is part of the problem, particularly for the older, more “traditional” members of this field. Some historians cannot see past the social “mob” aspect of social media and cannot grant the platforms value. My own advisor seemed incredulous to discover that students use Twitter for classes. For a young person like myself, social media makes sense as a vehicle for establishing a relationship between archives and classrooms, but for someone who didn’t grow up with social media, I can understand how it can be overlooked. The second article I read was from the crowsourcing chapter in Writing History in the Digital Age (2011), and it is about digital history and black Confederate soldiers. I really like the article’s emphasis on using digital history to help democratize the discipline, without sacrificing accuracy. For many people history is an almost esoteric discipline–they can’t grasp its functions and advantages, how it works, what is “true,” etc. (For the record, I believe there is no such thing as historical truth.) I think using the internet for displaying historical materials and research is a great step towards involving more people in history and expanding historical knowledge. And, like all good historians, Madsen-Brooks emphasizes that we still have to be critical of the information we find online. She delves into a discussion about “historians” and who historians are, which I think is an interesting consideration but somewhat of a moot point. Just because you aren’t a certified, PhD in history doesn’t mean you can’t make a valuable contribution of knowledge to the field. History isn’t limited to one discipline–it is interdisciplinary and multidisciplinary at its best. Anyways, Madsen-Brooks’ cautionary tale against content on the internet is great, because it truly is something that we have to take into careful consideration–and the same goes for print sources as well. I think her analogy at the end of the article is a nice description of where the digital history field should go/is going: historians are the “guide[s] on the side,” helping to guide others engaging in history, teaching them how to think critically about their sources and analyze their information.1 Nevertheless, I see no problem with historians also taking center stage and making their own significant contributions, which can help guide and further inspire those engaging in history. The lesson for me from this article was that “the masses” are slowly infiltrating the field of history–which I don’t think is a bad thing–and that now more than ever, we need to be critical of our sources and information. The crowd can make valuable contributions to history. Maybe they can do simple things like transcribing, or maybe they can do analysis, who knows. Even if the analysis is inaccurate, we can still learn valuable lessons from them. For example, the Confederate records that Madsen-Brooks discusses highlight the difficulty of interpreting some primary sources and the different definitions of “soldier” that people hold today and held during the Civil War. Inaccuracies may bring to light new angles of a topic to consider. I’m not trying to say we should all go out and write wildly inaccurate pieces about history with reckless abandon–I am simply stating that there is a silver lining to this dark cloud of inaccuracies in democratized history that seems to be looming over some historians’ heads. Disclaimer: The featured image from this blog post is from Virginia Tech’s Digital History Reader, which can be found here. 1. Leslie Madsen-Brooks, “‘I nevertheless am a historian’: Digital Historical Practice and Malpractice around Black Confederate Soldiers” in Writing History in the Digital Age: A Born-Digital, Open Review Volume, edited by Jack Dougherty and Kristen Nawrotzki, http://writinghistory.trincoll.edu/crowdsourcing/madsen-brooks-2012-spring/ (accessed March 5, 2014).